Last weekend my dad was talking to his niece about restaurants (I presume that’s what they were talking about…I wasn’t there) and she suggested a place called Gus’s Fried Chicken that she had visited in Memphis and just loved. For our lunch adventures today, we had two special guests with us since our school district closed up shop for the day since it was take your child to work day. Audrey and BFF Carrie joined us! It was a little bit of a drive across the state line to get there but well worth the drive. If you know where the original Kansas City Joes (Oklahoma Joes) location is, its right around the corner from it. When we got there we were welcomed to sit at any table we liked and our waitress was right over to get our drink orders. Apparently they have cheap, big draw beers but that isn’t my jam and we all needed to function for the rest of the day so we didn’t partake. They serve coke products, always a thumbs up from me, and they were well mixed from the fountain. Dad and Carrie had sweet tea which they said was a very good sweet tea. This picture ALMOST didn’t happen! When it came time to order meals Audrey, Carrie and myself ordered the same thing: Chicken Tenders, baked beans and mac and cheese. Dad broke the mold and ordered a wing and breast meal with beans and fried okra. There is nothing fancy about the dishes (plastic/styrofoam plates) or silverware (plastic) but it doesn’t matter. The chicken is DELICIOUS. It is fried up perfectly, not leaving it super greasy. They tout “Hot & Spicy Fried Chicken” and we may have been a little nervous at first, but it was perfectly seasoned. It had a little bite to it but was a great addition to the flavor profile. The chicken was super moist and had flavor all the way through the meat and not just in the breading like some places. As for the side dishes, they were decent too. Dad enjoyed his fried okra. Everyone enjoyed the baked beans. The mac and cheese was decently cheesy but the noodles were a little overcooked reminding us sort of cafeteria mac and cheese. Still a decent side dish choice though. After the meal, we decided we needed to also try some desserts. It’s not every time we do that, but today it seemed necessary and appropriate. It was a very good choice. Between the four of us we got a piece of Chess Pie – cold for Audrey and I, a piece of Chocolate Chess Pie – warmed with ice cream for Carrie and a piece of Pecan Pie – warmed with ice cream for Dad. They were all yummy. I think next time I will get the Chocolate Chess Pie for myself. It was a great meal that we all enjoyed. Everyone was friendly there and we got great service. Gus’s will definitely be on my radar next time I want fried chicken out. I hope they continue to do well and add another (closer) location in town. In the interest of full disclosure, this weeks pick wasn’t technically a new restauarnt for us. That being said, it has been at least 25 years since and was in a different location when we last visited. I chose Haywards Pit Barbeque which now resides in Lenexa, KS. I barely remember going there as a kid, but seeing the hanging on the wall helped bring it back. That I remembered once I saw it. When we got there we were quickly seated and got menus. Dad had a hankering for okra so we got a fried okra appetizer. It was a plentiful portion! Dad and I both went with the lunch special which was regular sandwich with you choice of one or two meats, your choice of two sides and a drink for $11. My sausage and brisket sandwich with fries and cheesy corn. Dads brisket sandwich with beans and cole slaw. We both were definitely full after our meals! The meat was good and served dry, which I prefer so I can add the sauce myself. I thought the slaw was kind of bland. The beans had good flavor to them as did the cheesy corn. I am still pondering over the spicing of the cheesy corn and need to do some investigating. I liked the spiced up twist on the usual cheesy corn. The fries were my favorite part I think. They were big meaty fries that were fried up perfect so they had a crispy bite but the middle was so soft and pillowy and perfect. MMMMMmmmmmmmm! All in all it was a great meal with good service. While we were there, I did overhear someone (the manager maybe?) go up to the table by us to inquire about their ribs and if they were overdone and when they agreed that yes, maybe they were, she got them fresh ribs and apologized profusely. That’s not something you usually see without the customer having to mention it first. Kudos. As I mentioned in my last post, we hit too spots this past week and both were repeats that we wanted to introduce Grandma to. Thursday Dad picked the place and it was The Majestic. Its a classy old joint on Broadway in downtown. Dad has a thing for classic old buildings and this one doesn’t disappoint. Our server, Brandon, was fantastic. Warm, friendly and attentive. We all chose different things off the menu and none of us were disappointed! Top – My meal which was the Four Cheese Mac and Cheese with Chicken and golden beets as a side dish. I had never had (or even heard of!) golden beets but thought I would give them a shot. I still am undecided about them. They weren’t bad but they weren’t amazing either. But I did try something completely new! Middle – Grandma’s meal. She got the Turkey on Ciabatta sandwich that was on the specials menu with a side of asparagus. We all tried the sandwich and it was delicious. Both Dad and Grandma said the asparagus was good too. Bottom – Last but not least is Dad’s meal of a soup and sandwich combo. His sandwich is a French Dip (yes, again) and his soup is broccoli cheddar. Both were good and seasoned well. I was perusing the website and I didn’t really think about where they do the jazz music but apparently the downstairs of the building is the “Jazz Club” where they have local live Jazz musicians every night and you can dine down there too. During prohibition, there was a speakeasy down there. Must splurge sometime and go in the evening! Dad and I went to lunch twice this week, but they were both repeats. BUT! Grandma was up visiting and we wanted to show her some cool places that were sure bets. Plus we went there before I was writing these little reviews so we needed another try, right? Our first pick of the week was Tuesday was mine and we went to Harvey’s at Union Station. When you go, ask to sit upstairs. Since its in the “lobby” of Union Station, you get a great view of Union Station from up there! Its a beautifully restored old building and I’m glad its part of our wonderful city. When we sat down and was perusing the menu my eyes were drawn to the onion rings and I decided those needed to happen first. I didn’t get a picture of them before they were devoured. It was a generous helping of perfectly breaded and cooked onion rings with generous sides of ranch (my fave) and ketchup. I think we all give the appetizer alone a solid 5! There were lots of yummy things to choose from on the menu and I was struggling with making a decision. The top picture is my meal. It was Panko crusted chicken with ham and cheese over mashed potatoes and served with green beans. The chicken was great but the ham and cheese on it made it too salty so I pushed that aside. It was a good change of pace. The middle is Grandmas meal She went for the baked potato soup and a house salad. She said the soup was a bit too salty and the salad was not cut up enough (what is up with that when you order salads at restaurants these days?!?). Dads meal was the bottom picture. He opted for a French Dip sandwich with a side of fruit. He’s not even a horseradish fan but said the sauce was decent. Scores? Last time Dad and I both gave it a 4. This time? After lunch we went across to the World War 1 museum at Liberty Memorial. Another great place to visit! Lunch log: Thursday April 7 2016, The Firehouse on 20th St Bar and Grill. Dad’s pick. After going to another North Kansas City restaurant last week, Dad was inspired to explore NKC a little bit and came across The Firehouse (also known as Christines Firehouse) on the interwebs. It’s in an unassuming building behind the CVS in NKC. Its a cozy atmosphere inside with mostly high top seating at tables. They were busy at 11:30 when we got there and had to wait for them to (quickly) clear a table so we could sit. There were three people rounding the room and providing quick and friendly service in tandem. They have daily specials, which Thursday was $1.00 tacos. I saw some come out and it was tempting to order the tacos but upon perusing the menu, the Pulled Pork Nachos were calling my name louder than the tacos. Dad had read about the tenderloin there and wanted to try that. As you can see, the portion sizes were HUGE. My pulled pork nachos were delicious. I have been craving good pulled pork nachos since Josh and I went to the Ozarks last year and I had my first brush with that magic. These had lots of delicious pulled pork and cheese on crispy chips.. Yummmmmmmmmmmm. Dad’s tenderloin also did not disappoint. It was GIGANTIC. They didn’t make it that big by pounding it super thin, either. It was seasoned well and at least 2/3 of it was left after dad was well past full. You can even order and extra bun and condiments to share with someone else. Another week, another lunch date with Dad! Since we were playing catch up, it was my decision again. My BFF had told be about this burger place, Tay’s Burger Shack, in Northtown and I decided it was time we tried it out. It’s in a tiny little building that I have always noticed and never visited. Well, thats not true i’m told. In 1981, a bar inhabited the building and I was in it with my dad, after he had gotten laid off from his job. I was 5 months old at the time. My memories of it are unclear, naturally. It’s a clean and quaint little place. You walk in and order/pay at the counter then sit down and they bring your food out to you. At every table, along with the usual condiments, there was a bottle of house made Sriracha ketchup and sriracha mayonnaise. A little too spicy for our tastes, but was still good. Our food came out quickly and was clearly fresh. The fries were hand cut with a delicious seasoning on top of them. The cheese on mine was a yummy addition. Dad got chili and cheese and the chili had some spicy tang to it. After we finished our meal we were contemplating our next move when we were brought a cup of ice cream and a comment card. When he brought it to us he said he was trying out a new flavor and wanted our honest opinions. The new flavor was root beer ice cream. It was pretty decent. Our suggestions were to add more root beer flavor and maybe make it a little creamier. I would buy it if it was on the menu.! Aaaannnddd…we’re back! After taking a month off due to illness, travel and work Dad and I were back at it today. So. 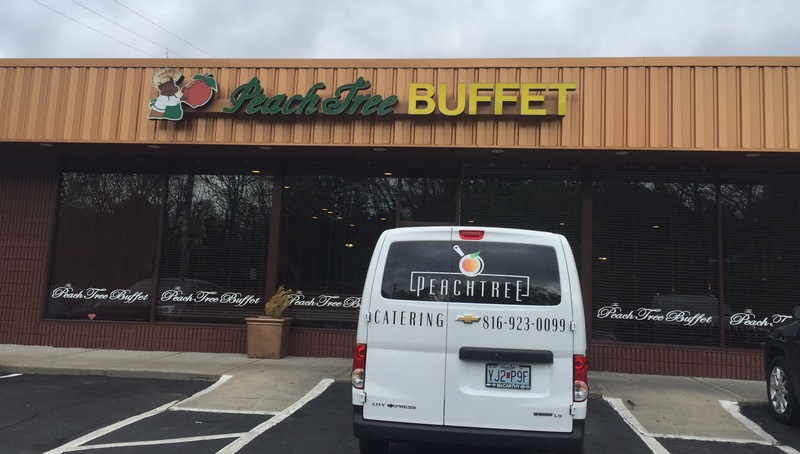 The Peachtree Soulfood Buffet was our destination of choice. Dad had been there, a couple years ago but thought it was a must try for me. Peachtree sits right of 435 an Eastwood Trafficway in an unassuming building. Facing the street is the buffet restaurant and around the corner, in the same building, is a cafe (but we went to the buffet). We arrived shortly after their 11 opening time and were the first patrons there. They had an assortment of hot and fresh foods on the bar and ready to go. Upon perusal of their website (just a few minutes ago) I see that they feature different meats and such on different days. All of today’s offerings were yummy. I liked everything I tried and so did Dad. They also had a good selection of desserts including peach cobbler, chocolate cake and other cakes. The cakes were portioned out in a case already. The slices looked skimpy but in reality they were perfect size for desserts. I didn’t get many pictures as we were too busy enjoying our meal! We had a great meal and I will most certainly be back, with new people in tow. It never fails to amaze me that there are SO man different food options in this town. Dad and I have tried a lot of places so far and I know we have barely scratched the surface. Dads last pick took us to the Columbus Park area of town again, to The North End. It is a small place with an obvious large following. There is a bar and a few tables to sit at. You order at the counter and then find a table and they bring your food to you. Too be honest, I think we were both a little thrown off when we got there. The problem, at least for us, is when you have to order at the counter off a big menu on the wall we both really feel the pressure to hurry up and just order the first thing that sounds good. For both of us that day, it was the special, which was Beef Stroganoff. Dad also added on an order of the Fried Meatballs on a whim. We had a fairly short wait for our food, and our appetizers and entrees came out at the same time. The meat balls were big! They had nice seasoning to them and the marinara sauce to dip them in was good. They were nice and moist, too. Our stroganoff was good too. It’s different from the stroganoff I was raised on but it was a nice difference. The portion was generous and came with a side of hot bread too. Dad was super impressed that the meals came on actual plates, which you wouldn’t normally expect from the way the restaurant is set up. So. What did we think? We both had a good meal and would go again. This post is a two-fer. I forgot to post about our visit to the Silver Spoon Cafe a couple of weeks ago and then this past week we went to Herrdura Mexican Restaurant. Both of these were Dad pick weeks as it turns out. I recently gave dad a map that I picked up at the conference I went to here in town earlier this fall. It has all the food/drink venues in the downtown area listed on it. It may be our new “restaurant bible”. He used this newfound map to choose the Silver Spoon Cafe. There are two locations downtown and we visited the one Wyandotte location. Thursday was the day we were there and the special that day was Taco Salad/ Nachos. I chose the taco salad and dad chose the Nachos. Both were decent meals. I would go back to try other things. They have quite the menu but we were so overwhelmed, we both just went for the special. My taco salad, Dads nachos not pictured! The best part of the meal, however? Dessert. They have homemade cookies for sale on plates. Dad chose a plate of iced sugar cookies. They were fabulous. Buttery and perfect. YUM! Next up is this last weeks lunch in Excelsior Springs. We decided to make a trip up to Excelsior to get a new trailer jack and do some looking around at a couple of thrift/”junk” shops and thought we would try another Excelsior restaurant. This one happened to be Herrdura Mexican Restaurant. Its a nice little place with your standard Mexican fare menu. I don’t remember what we all got (and there is a lack of photographic evidence). The Mexican rice was very good and my meal was solid. Dad and Audrey both agreed. What really stood out was Dad loves Flan and he believes that they have the BEST flan he has ever tasted. I don’t think we would drive all the way up there to eat there, but would definitely stop in if we were in the area and wanted a solid Mexican meal. This week’s choice has been on the radar for awhile now. We noticed it on the way to another lunch spot earlier this summer and then a few days later a friend was raving about it. Finally we made it there, and we aren’t sad about it either! When we walked in we noticed it was already a hoppin’ place. We always try to get to places “early” to beat the lunch rush so usually we get there around 11:15 and watch the place fill up. This was not the case at Q39. There were already about half of the tables filled with customers! Our waitress immediately brought us a bottle of water for the table and 2 glasses and offered other drink choices. She also explained the menu and some of her favorites for us first timers. After taking our orders I pulled out my phone to check us in on Facebook, as I usually do, and check a couple of things. Not more than 5 minutes after taking our order, the food arrived! Both meals were DELICIOUS. The beef was tender and not too fatty and the pulled pork was flavorful and moist. They have 3 sauce choices: classic, zesty or chipotle-cilantro. I am a classic kind of girl but the waitress recommended the zesty with the pulled pork and she was not mistaken! It was the right amount of vinegary flavor to go with the pork. Dad and I were both pleased with the entire experience. We were in and out of there in just over 30 minutes and were glad we went early as there was a wait by the time we left, before noon even hit! Next time I need to try the onion straws.